Yesterday, former Secretary of State Madeleine Albright spoke at the Ford Museum in Grand Rapids. MLive sent a reporter who acted primarily as a stenographer. What the Clinton administration Secretary of State said, the MLive reporter wrote. No questions asked, no verification of what she said and no mention of any major foreign policy matters she omitted. The Mlive article focuses on a story that Albright shared about the Cuban use of the word cajones (Spanish for balls), which MLive never translates for readers. However, the more important point about this story was that Albright justified a practice of US intimidation and harassment of Cuba, with regular US military fly-overs being one aspect of that policy. Again, the MLive reporter does not question Albright’s assertions about these policies, but accepts them as fact. 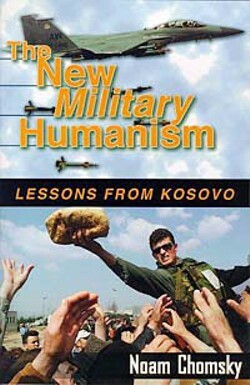 Noam Chomsky refers to the US/NATO intervention in Kosovo as war crimes, a claim that was supported by an independent tribunal held in August of 1999. On the matter of Rwanda, it is true that the US did not intervene militarily, but it doesn’t mean they were neutral. The fact is that the majority of weapons used in the Rwandan genocide were small arms, most of which came from the US and some European countries, as has been documented by Human Rights Watch and other independent foreign policy analysts. The trafficking of small arms was rampant during the Clinton years. The MLive article continues with Albright commenting briefly on current US foreign policy, followed by a series of one-liner comments that were light hearted. 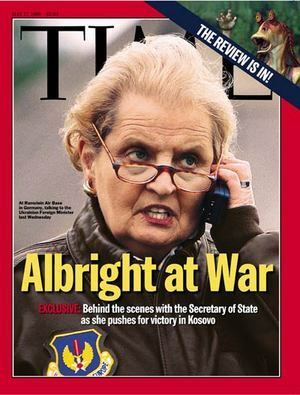 In addition to MLive’s failure to challenge or verify any of the major foreign policy claims by former Secretary of State Madeleine Albright, they also omitted one major foreign policy matter during her years in the Clinton administration. There is no mention of Iraq in the 1990s. This is no minor omission, since the Clinton administration facilitated the harshest form of international sanctions ever imposed on a country. After the Gulf War in 1991, the US/UN imposed sanctions on Iraq, a policy which lead to two different UN diplomats resigning in protest because of the brutality of these sanctions. One official that resigned was Denis Halliday. Halliday resigned because the sanctions resulted in the deaths of thousands of Iraqi children, in a policy that Halliday referred to as genocide. The United Nation’s estimated that roughly 500,000 Iraqi children died as a result of sanctions. This is a statistic that the US and particularly Madeleine Albright did not dispute. While being interviewed on CBS, Albright was asked if the death of 500,000 Iraqi children was worth it, to which Albright responded, “We think the price was worth it.” Here is the exchange between Albright and Leslie Stahl.